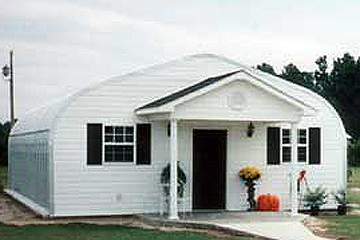 Price and Purchase your metal building for homes and home additions here! Would you like to finally add that home addition you’ve been thinking about for all these years? You’ve come to right place! U.S. Buildings’ structures are not just for backyard sheds. We can turn your dream of a larger home into a reality with our fully customizable, scalable buildings. In many cases, our building will blend right into your home as if it was planned from the start. Our metal buildings can be adapted to attach to existing structures with tie-in-flashing, whether your existing structure is metal, wood, block or any other type of material. Call U.S. Buildings now toll-free at 800-222-6335 to speak with one of our steel building specialists. Be sure to ask about our monthly money saving building specials that could save you up to 60% off your steel structure. Let us know about the specifics of your building projects and we’ll provide you with great options, a competitive price and a building that you’ll be proud to show off. Call us now!